Join us at the Backpack to Briefcase (b2B) – Economics Career Panel. This is a great opportunity to network with alumni and learn about the various career paths you can take after graduation. Moderated by the Professor Gillian Hamilton, alumni will speak on their experiences at U of T and discuss how to pursue a successful career. After the panel, join alumni, faculty and peers at an informal reception where FREE FOOD will be served! REGISTER HERE. When: Thursday, March 28th, 12 – 2 P.M.
Florence Narine, Senior VP, AGF Investments Inc.
To learn more about attending alumni, faculty and registration, click HERE. The Governor's Challenge is a competition for undergraduate university students which, by putting students in the role of advisor to the Bank of Canada's governing council, promotes understanding of the role of monetary policy in Canada's economy. Having analyzed economic developments, the team must form a forecast and make recommendations on whether to adjust the key interest rate. This year has seen more than 100 students from 25 Canadian universities entering the competition. Our team – the top five students from the new course ECO466 "Empirical Macroenomics and Policy" – has been selected, following a presentation made via video conferencing, to participate in the final. That takes place at the Bank of Canada's headquarters in Ottawa on February 10, 2018. 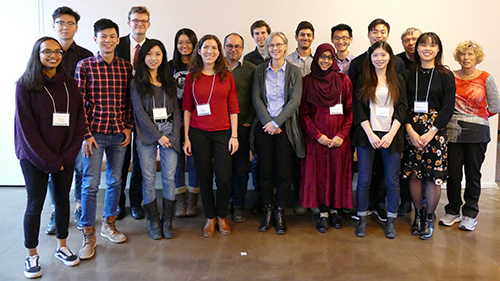 Only five teams are selected for the national final – this is the third year of the challenge and the third time U of T has been in the final. So we are firmly of the mind that this opportunity will be third time lucky!